Here is another shot from the Bourne Mansion in Sayville, New York. This stately old mansion with it’s beautiful classic architecture is not only an elegant venue for a wedding reception, but is also a wedding photographer’s paradise. The venue is located on the campus of St. John’s University on Montauk Highway as part of the former LaSalle Military Academy complex. Stunning photo opportunities are everywhere from the intimate bridal suite to the magnificent Grand Ballroom. Outside there are sprawling lawns leading to the waterfront of the Great South Bay and a tree-lined drive leading to the grand entry to the mansion (Where this shot was taken). We created all of the bride and grooms formal portraits, bridal party pictures and family portraits prior to their candlelight ceremony in one of the mansion’s extravagant rooms. Most of my bridal couples are choosing to schedule their wedding day in this fashion. We capture all of the details of the bride and her bridesmaids getting ready for the big day. Then comes the reveal where the groom gets to see his bride in her dress for the first time. All the formal photographs are taken prior to the ceremony so that when the couple says "I Do" they kiss and head down the aisle and straight into their cocktail hour...which is exactly where they belong; partying and having fun with all of their friends and family. My team will still be around to the end of the wedding reception (when you cut your wedding cake, dance with your parents, etc), making sure to candidly capture every single joyous moment. Your wedding day is going to fly by so fast. I want you to enjoy every single minute of it. 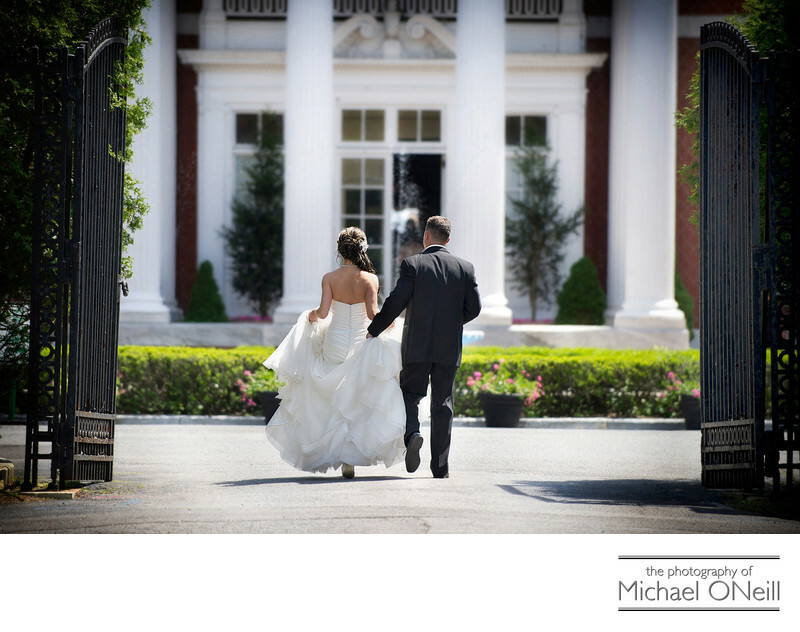 So whether you are planning a wedding at The Bourne Mansion, or at any other catering venue in the Greater New York, NYC or Long Island area, give me a call. Lets sit down and discuss your plans for the big day and work out a wonderful itinerary that insures you get to enjoy every minute of your once-in-a-lifetime event.